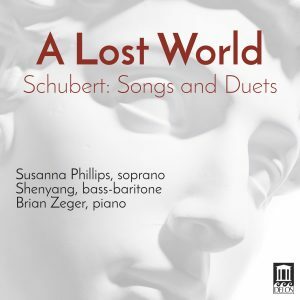 Schubert's Lost World | Brian Zeger | Delos Music | Outstanding Classical Recordings for over 40 Years! Fair world, where are you? Schiller’s poignant verses express the longing of the German Romantics to connect with the power and pathos of the classical world. Several years ago, the Metropolitan Museum of Art hosted an extraordinary exhibit featuring works from the remarkable archeological site at Pergamon in modern-day Turkey. When I was asked to build a concert to accompany the exhibit, my mind went immediately to the early German Romantic poets. Living in early 19th-century Germany and Austria, what was it about Greek myths and literature that ignited their imaginations and, in turn, the creativity of the composers who set these texts to music? Looking for songs on classical subjects, I found that I already knew many of these Schubert settings and was delighted to encounter some songs less familiar to me, espe- cially the two duets Antigone und Oedip and Hektors Abschied. I had the great pleasure of working with both soprano Susanna Phillips and bass-baritone Shenyang when they were students at Juilliard. Both artists possess the rare gifts to bring this marvelous repertoire to life. Many listeners are familiar with Schubert’s better-known songs—distillations of deep feelings about love, death, nature and the metaphysical. To encounter these same themes through the lens of the classical world adds an extra dimension to the songs as this “lost world” continues to resonate to the present day.